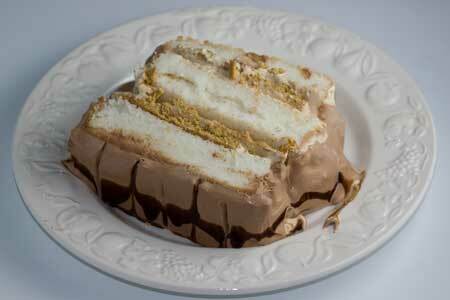 An angel food cake loaf filled with mocha flavored mousse and topped with chocolate whipped cream. Cut the cake into three layers. Prepare mousse. Put 1 tablespoon of boiling water in a mixing bowl. Add the coffee and stir to dissolve. Add the marshmallow crème and beat with a handheld mixer smooth. Fold in the whipped topping. Line inside of a 9 inch loaf pan with plastic wrap and place the first layer of your angel food cake in the pan. Spread about 1/4 of the mocha mixture over the cake. Lay graham cracker rectangles sideways across the mousse, trimming them so that they are the same width as the cake. Spread a little more mousse filling (another 1/4 ) over the crackers and top with second layer of cake. Repeat, layering mocha mouse, more graham crackers, and remaining mocha mousse. Cap with top layer and put plastic wrap over the cake. Put the whole thing in the freezer and freeze for about 3 hours or until cake is solid or at least easy enough to work with. Remove frozen cake from freezer and lift cake from pan. Peel away plastic wrap and set frozen cake on a cake tray. Spread chocolate whipped cream (or Cool Whip) over entire cake. Chill for about 4 hours or long enough so that graham crackers soften. When ready to serve, drizzle cake with chocolate syrup and cut into 4 to 6 large slices.